I was so happy to have this recipe featured yesterday on a website I love, A Cup of Jo, as “The Best Peach Tart You’ll Ever Have”!. 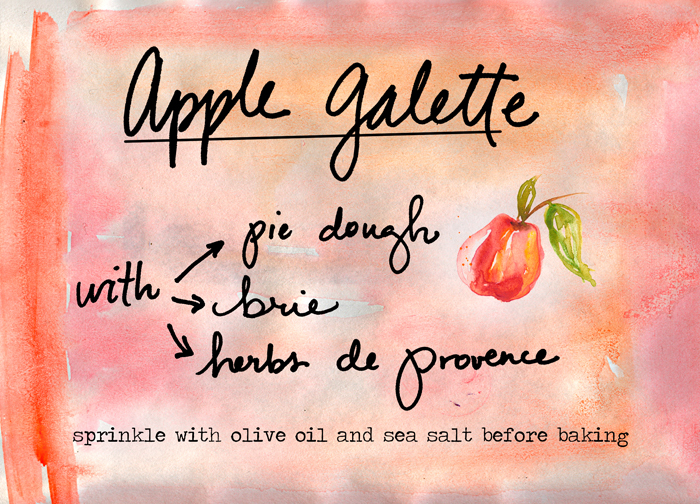 This peach tart (technically a galette) is simple, pretty and delicious! Just roll out one store bought pie crust (or make your own, if you fancy). I used the kind that comes rolled in the long red Pillsbury box in the refrigerated section. Spread a thin layer of ricotta cheese over the dough, leaving about a 1 inch border. Sprinkle the ricotta with a bit of cinnamon and sugar, then layer thinly sliced peaches over the cheese. Fold and pinch the corners over to make a little crust, then bake for 20 minutes or so on a cookie sheet at 350 degrees until browned. Before serving, I like to drizzle a little good olive oil and add a pinch of coarse sea salt to each slice. You’ll need: 1 (pre-made) crust, 2 to 3 peaches (no need to peel), 1 small tub ricotta, cinnamon, sugar, olive oil, sea salt. Bon appetit!